Xiao Tuo Cha Pu-erh tea is compressed into tiny "birds nests" and aged for several years where the characteristic earthy flavour develops. Xiao Tuo Cha Pu Erh reputed to assist in weight loss. 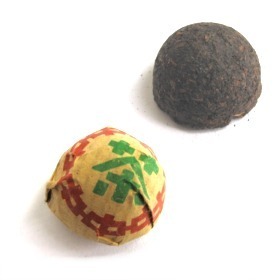 Individually wrapped with paper, the Xiao Tuo Cha are an ideal size (6 grams or 0.21 oz) for family or large serving. It is oxidized slowly, through an aging process, that is thought to bring out a deeper, more varied flavor from the tea. Pu Erh is the only tea that improves in flavor and value with age. Mellow flavor with some of the classic Pu-erh earthiness. Tea leaves pressed into small cakes shaped like bowls or "birds nests." The liquor is dense and reddish-black. Use 1 piece for one big cup or teapot (according to taste). Steep in hot water at 100°c (212°F) for 2 to 4 minutes. Rinse the tea once or twice. If you like milk with your tea, add sweetened/plain dairy milk and stir. Very earthy flavor, several infusions. I like the way its packaged, you can take it anywhere.